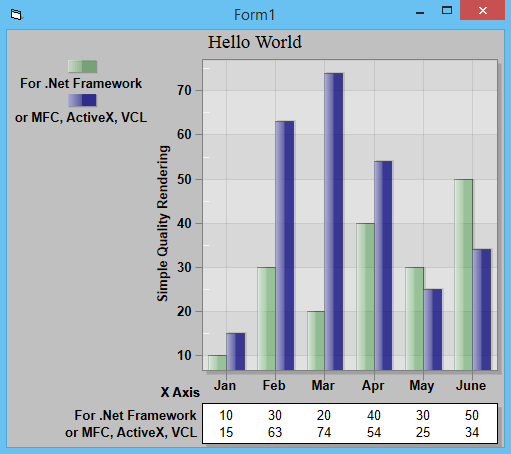 The following information demonstrates how to create your first Visual Basic v6 / ProEssentials implementation. It discusses installation, adding ProEssentials to a project, writing your first few lines of code, and shows the final results. 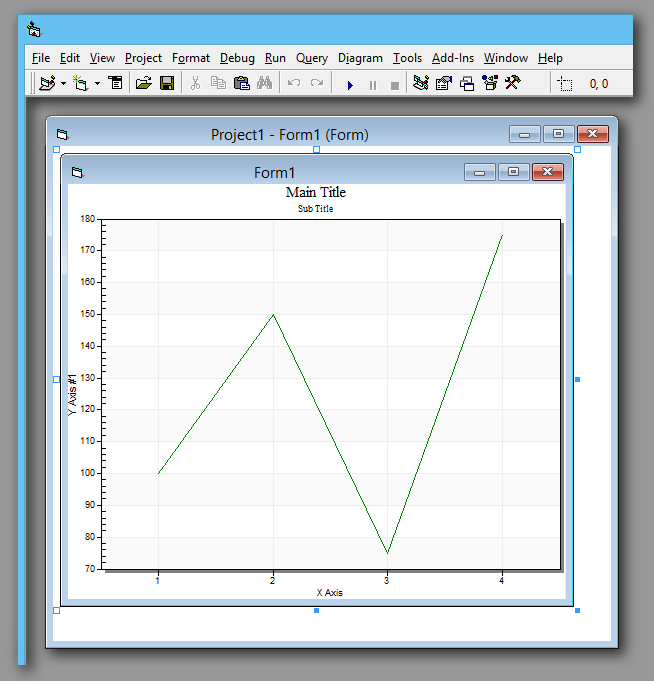 The setup program also registers the ActiveXs with the operating system, which prepares Visual Basic for inclusion of ProEssentials components. You can manually register an ActiveX with "REGSVR32.EXE" found in your system32 or syswow64 on 64 bit systems. You can also use this utility to manually un-register an ActiveX by using the "-u" command. After installation, launch Visual Basic and create a new "Standard EXE" project. 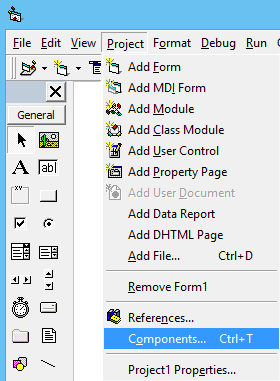 Use the Project / Components... menu item to open the "Components" dialog. 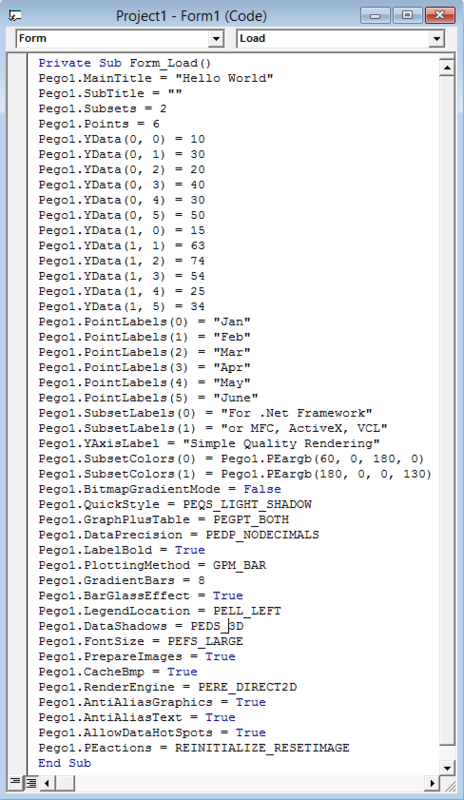 Pego1.SubsetLabels(0) = "For .Net Framework"
Pego1.SubsetLabels(1) = "or MFC, ActiveX, VCL"
Pego1.YAxisLabel = "Simple Quality Rendering"
Click the "Pego" control from the ToolBox and then click and drag a rectangle selection on Form1's canvas. 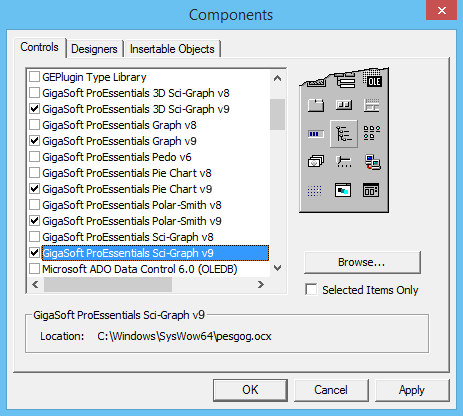 Note, ProEssentials Std uses control name "PegoStd". The adjacent image shows what you see. This represents the default state of a ProEssentials Graph. The default state has one subset with four data points. In the course of constructing your own charts, you'll set the properties Subsets and Points which define the quantity of data your chart will hold. You'll then pass data via the YData(subset, point) two dimensional property array. The following section shows example code of passing data. Note, if we were constructing a Scientific Graph (Pesgo), we'd also set XData(subset, point). SubsetLabels sets the first subset label. (1) sets the second subset label. 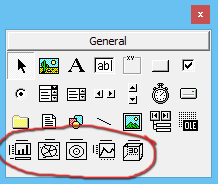 Use Visual Basic's Run / Start Menu (short cut F5) and you'll see the resulting form to the left. Congratulations, you've just completed your first Visual Basic / ProEssentials implementation.